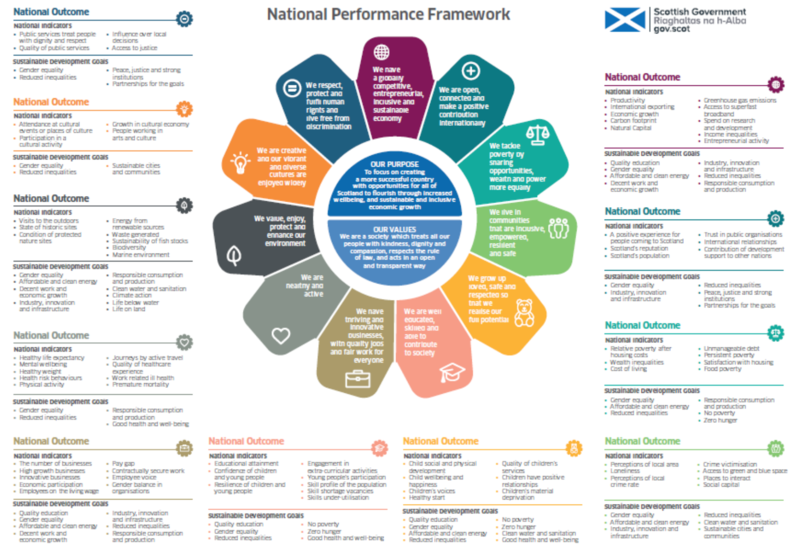 The Scottish Government’s revised National Performance Framework is important to us all. It sets the Scottish Government’s overarching purpose and the indicators that show how the Government is performing against National Outcomes that cover economic, health, social and environmental areas – issues that connect with our work. The NPF is also important for champions of the UN Sustainable Development Goals (SDGs). The Scottish Government committed to aligning the current NPF with the SDGs in Scotland’s first Open Government Partnership Action Plan, and has pledged to measure progress towards the Goals through its performance framework. That’s why the revised NPF laid before the Scottish Parliament in April is so important; it’s the first real sign of a plan for the SDGs in Scotland. We are also beginning to see Parliament take an interest in the Goals, as the refreshed NPF makes its way through the Committees ahead of a Parliamentary Debate at 2:30pm on 24th May. In January, members of Scotland’s SDG Network helped mobilise over 80 organisations and 250 people to sign our open letter on the SDGs. It called on key decision makers to show their commitment to the Goals. Since then, we have received responses from the First Minister, the Scottish Parliament, the Scottish Conservative Party and Local Authorities. The First Minister’s message was clear. The Scottish Government will be using the refreshed NPF to measure Scotland’s progress towards the SDGs; the Goals are front and centre in the design of the draft NPF and they are linked to Scotland’s 11 new National Outcomes. The letter also confirmed that the Scottish Government has put in a bid to share its methodology for measuring progress at the next UN High Level Political Forum in July 2018. This makes the Parliament’s inquiry into the refreshed NPF all the more important, and it’s reaching the final stages. The Local Government and Communities Committee, which has led the scrutiny process, has published its report on the Scottish Government’s draft National Outcomes ahead of the debate. The Irish Government’s publication of its first National Implementation Plan for the SDGs (take part in a webinar on this on 31 May) could serve as a template to remedy this issue in Scotland. The inquiry has seen a number of Scottish Parliament Committees raise the importance of the SDGs to Scottish life. The Equalities and Human Rights Committee, the Economy, Jobs and Fair Work Committee and the Environment, Land and Climate Change Committee have all shared a common position; further information is needed on how the Scottish Government will embed the SDGs beyond the NPF and across public life. The response to our open letter from the Chair of the Conveners Group, Christine Grahame MSP, highlighted the collective ambition of all Committees to ‘ensure that the SDGs are reflected as a key element of the scrutiny their Committees undertake.’ We received a number of responses from Committees highlighting the key scrutiny work they’re undertaking that fall under the SDGs, and their commitment to the Goals is evident in the Committee’s report on the draft National Outcomes. As the First Minister points out in her response to the network, the SDGs can only be achieved through partnership and genuine collaboration. This will happen if people are aware that the SDGs exist and of the role that they themselves can play. The purpose of the SDG Network’s open letter was the raise the profile of the Goals ahead of this important review of how Scotland measures its performance. This might be a global agenda, but it’s a national and local one too; our 300+ signatories have played their part in making that clear.